Numerous people tend to have an uneven complexion due to evident speckles and patches of brown spots. This is commonly due to sun exposure with age. These areas of pigment deposition, known as melasma or lentigo/solar lentigines, are found on the face, neck and chest making them noticeable and difficult to camouflage. Intense pulsed light (IPL) energy is delivered to the skin and accompanied by topical treatments to break up the deposits of pigmentation. 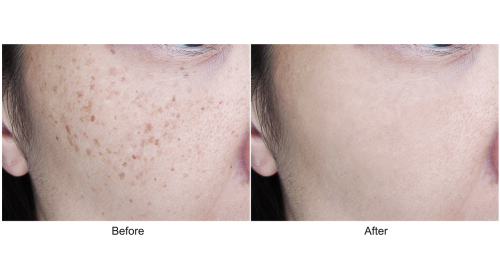 The number and extent of treatments required depends on skin tone and the size of brown spots. Usually, a minimum of 3 treatments (range 3-6) are performed at 2-4 week intervals for optimal results. Recovery after IPL is minimal and can consist of mild redness of the skin and a “sunburn” sensation that subsides within a few hours. There may be temporary skin scabbing at the treatment site but this is typically resolved within 1 week.